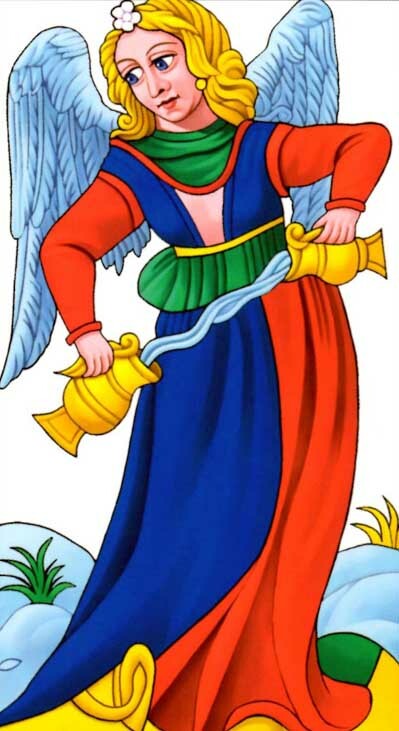 Temperance is the fourteenth Major Arcana in most tarot decks, but sometime different authors used different names for this trump: Time (P. D. Ouspensky) or Art (Aleister Crowley). 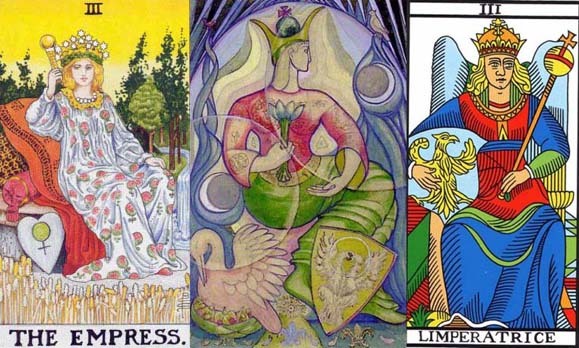 We’ll see how Temperance is interpreted by four important masters of tarot: the British occultist A. E. Waite (1857-1942), the Russian mathematician and occultist P. D. Ouspensky (1878-1947), the English occultist and ceremonial magician Aleister Crowley (1875-1947) and Spanish-born French occultist and founder of the modern Martinist Order, Papus (1865-1916, his real name being Gérard Encausse). 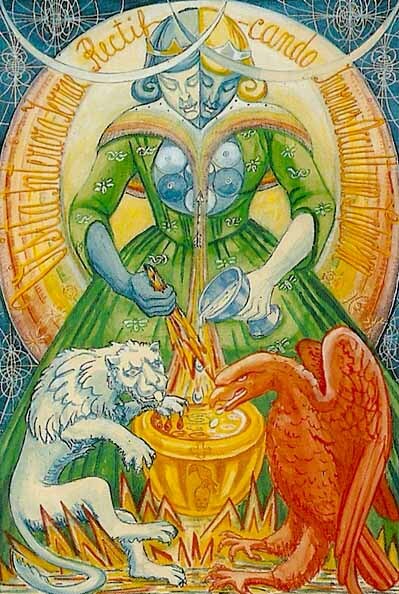 The divinatory meaning of Temperance is, according to A. E. Waite, expressed by the following words: „economy, moderation, frugality, management, accommodation“. 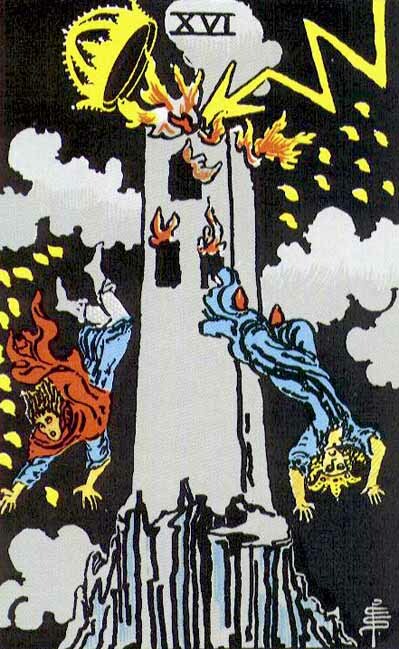 When it is reversed, this card can signify: „Things connected with churches, religions, sects, the priesthood, sometimes even the priest who will marry the Querent; also disunion, unfortunate combinations, competing interests“. In his chapter about the doctrine behind the veil, Waite explains the name of this Greater Arcana as follows: „It is called Temperance fantastically, because, when the rule of it obtains in our consciousness, it tempers, combines and harmonises the psychic and material natures. Under that rule we know in our rational part something of whence we came and whither we are going“. Another part of his explanations is essential: „hereof is some part of the Secret of Eternal Life, as it is possible to man in his incarnation“. When he sees the angel of Temperance, Ouspensky understands that he is „near the ultimate mysteries, from which there is no return“. „The name of the angel is Time. The circle on his forehead is the symbol of eternity and life. Each life is a circle which returns to the same point where it began. Death is the return to birth. And from one point to another on the circumference of a circle the distance is always the same, and the further it is from one point, the nearer it will be to the other. Eternity is a serpent, pursuing its tail, never catching it. One of the cups the angel holds is the past, the other is the future. The rainbow stream between the cups is the present. You see that it flows both ways. This is Time in its most incomprehensible aspect. Men think that all flows constantly in one direction. They do not see that everything perpetually meets and that Time is a multitude of turning circles. Understand this mystery and learn to discern the contrary currents in the rainbow stream of the present“. In „The Book of Thoth“, Aleister Crowley tells us that „there is a particular interpretation of this card which is only to be understood by Initiates of the Ninth Degree of the O.T.O [Ordo Templi Orientis]; for it contains a practical magical formula of such importance as to make it impossible to communicate it openly“. „ The original duality has been completely compensated; but after birth comes growth; after growth, puberty; and after puberty, purification. 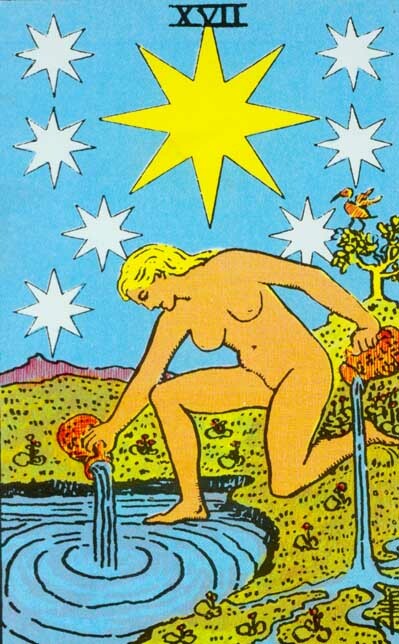 In this card, therefore, is foreshadowed the final stage of the Great Work. Behind the figure, its edges tinged with the rainbow, which has now arisen from the twin rainbows forming the cape of the figure, is a glory bearing an inscription, VISITA INTERIORA TERRAE RECTIFICANDO INVENIES OCCULTUM LAPIDEM. („Visit the interior parts of the earth: by rectification thou shalt find the hidden stone“). Its initials make the word V.I.T.R.I.O.L., the Universal Solvent“. „The counsel to «visit the interior of the earth» is a recapitulation (on a higher plane) of the first formula of the Work which has been the so constant theme of these essays. The important word in the injunction is the central word RECTIFICANDO; it implies the right leading of the new living substance in the path of the True Will. The stone of the Philosophers, the Universal Medicine, is to be a talisman of use in any event, a completely elastic and completely rigid vehicle of the True Will of the alchemists. It is to fertilize and bring to manifested Life the Orphic Egg“. Combination of active and passive fluids. Entry of Spirit into Matter, and reaction of Matter upon the Spirit – INVOLUTION. 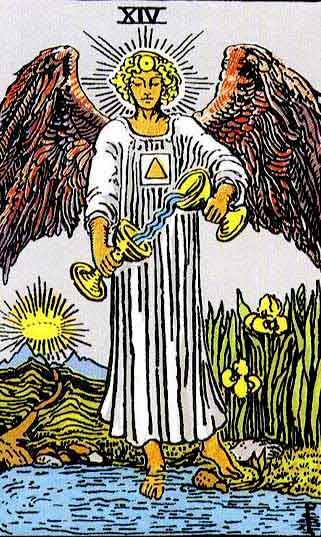 Reflex of Justice in the material world – TEMPERANCE. Fixation of reflex Life. Incarnation of Life – INDIVIDUAL AND CORPOREAL LIFE. Share the post "Temperance – Major Arcana Tarot Card Meaning, according to Waite, Ouspensky, Crowley and Papus"